Flappy Bird is an addictive mobile video game. Think of a game that is obsessive and competitive; a game you’d willingly play for hours just to try beat it. That game is Flappy Bird. Flappy Bird was a mobile video game that was launched in 2013. It was developed by a Vietnam-based developer named Dong Nguyen, and was published by .GEARS Studios, a small, Vietnam-based independent game developer. The premise of the game is simple, very simple in fact. It features a bird named "Faby". The player controls the bird and tries to direct it to cross a series of pipes, which are based on another popular game, Mario. When the player taps the screen, the bird briefly flaps upward. When the screen is not tapped, Faby will fall to the ground due to gravity. If the bird touches the pipes or the ground, it’s game over. Sounds simple, right? However, the game is very difficult and it is possible for new players to die a few times without even scoring a point. However, many people found the game addicting. The game was launched on May 24, 2013. At first it was only available in the iOS App Store, but was later launched on Android and Amazon Fire TV. The game really reached popularity in 2014, so much so, that in January 2014 it was the most downloaded free game in the iOS App Store. At the height of its popularity, it is estimated that the game was earning up to $50,000 a day from in-app advertisements as well as sales. The game publisher, .GEARS Studios, described the games as "heavily influenced by retro pixelated games in its golden age. Everything is pure, extremely hard and incredibly fun to play." In fact, it was one of the hardest games available on the platform. Critics of the game criticized the games its level of difficulty and alleged plagiarism in graphics and game mechanics. Due to the difficulty of the game, many critics started harassing the developer, Dong Nguyen. Eventually fed up, he decided to discontinue the game to the chagrin of millions of fans and supporters. 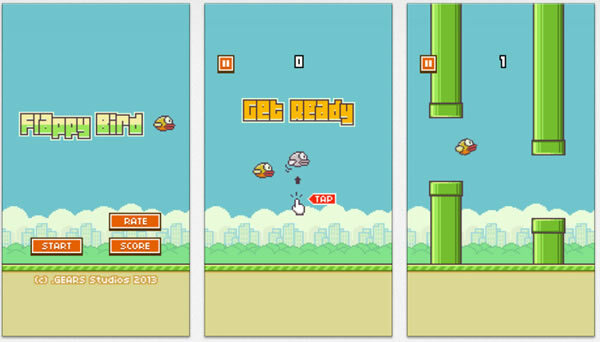 While this did not impact old fans that had already downloaded the game, new players could not download the game and learn the frustrating magic of Flabby Bird. However, due to the popularity of the game, there are many other games that try to emulate and some imitated the original gameplay. Hence, there are many alternatives available to Flappy Bird.